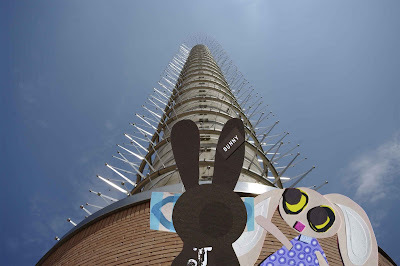 "This isn’t the pyramid," said the Wabbit. "It’s the only big pointy thing I know round here," said Lapinette. "Worth a look," replied the Wabbit shaking his head. "Lapinette, that pyramid could be anywhere." "Perhaps it’s still in space," suggested Lapinette. The Wabbit nodded. "We could take Quantum and sweep the Quadrant." "Why don’t we?" said Lapinette, "it could be fun." "It’s just that I think it’s near here," said the Wabbit. Lapinette waited for an explanation. "The Alien and the asteroid were here," stated the Wabbit. "Check," said Lapinette. "And the pyramid was on the asteroid." "Check," said Lapinette. "But when the Alien left, I didn’t see the pyramid." Lapinette thought back. "You’re right. It looks like he left the pyramid here." "Where would you put a pyramid?" mused the Wabbit. "Anywhere," said Lapinette. "People don’t see things that are right in front of them." "But why would he leave it here?" Lapinette thought for a moment. "Because he’s coming back for it?" she breathed. "Or his employers." The Wabbit's face wrinkled. "We have to find it before them," said Lapinette. "And get it to Unut the Rabbit Goddess, she knows all about pyramids," said the Wabbit. "So do I," said Lapinette. The Wabbit turned. "There are quantum theories about pyramids," said Lapinette brightly. The Wabbit looked sceptical but Lapinette grinned. "We just have to find it, then turn it on." "With a switch?" asked the Wabbit.